So, you think you have what it takes to be a superhero, huh? Well, let us ask you this: Have you even chosen a superpower yet? If you haven't, then we better take a moment to find the right superpower for you before you get your costume! So let's think this through. Sure, you could have the all too obvious powers like super speed and super strength, but that's so overdone! You could fly, but people fly all the time. We think you need to come up with a superpower that's a little more unique. Like what if you were "Dog Whistle Woman"? Your power would be to be able to whistle at dog whistle frequencies, enabling you to call cute puppies to your side at any time. Or you could be "Toaster Girl". Your hands would get just hot enough to toast a bagel perfectly in about 3-4 minutes. Then you could have a perfect bagel, every time. 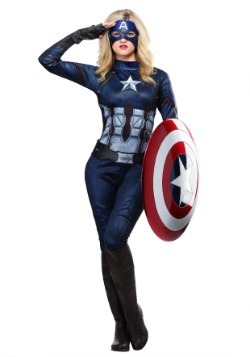 This costume is the perfect outfit for any superhero still picking out their powers. 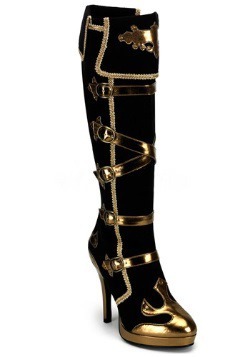 You'll be wearing a black bodysuit with gold bands wrapped around it. Over that, you'll be wearing the red sash that ties around your waist! 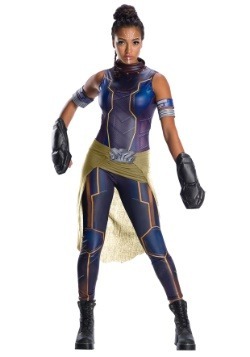 You'll be wearing matching arm gauntlets and boot tops, bringing your entire outfit to almost completion. The only thing you'll need after that is a mask, which we were happy to include with this costume. It's a simple black mask with an elastic band that goes around your head to hold it in place. Okay, so maybe our superpower ideas aren't the best. But we still think it's better to have something unique instead of something generic! Give your superpower ideas some real thought before choosing the perfect power for you. Then head out there and fight crime, even if all you have are toaster hands! X-Small/Small - $79.99 Only 5 left! Small/Medium - $79.99 Only 3 left! Large/X-Large - $79.99 Only 3 left!